A list of Frequently Asked Questions (FAQ's) are available below. Simply click on the question to display the answer. Do we need to purchase hardware and/or software to be able to use ScheduleME? No. Our system is a completely web-based system and purchase of additional hardware or software is not necessary. Can the system be customized to meet unique needs of each organization? Yes. 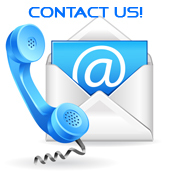 We customize our system based on requests that we receive from our clients. How much does it cost to customize the system? We customize the system at no cost to our clients. There are two fees associated with ScheduleME, an initial cost and a quarterly (3-month) maintenance fee. Both the initial cost and maintenance fee are determined on a per organization basis. Please contact us for a customized price quote. Is the maintenance fee for ScheduleME determined by the number of offerings or locations? No. The maintenance fee for ScheduleME is a fixed fee. You can add as many offerings and locations as you like. Is there a discount for paying the maintenance fee for the entire year in advance? Yes, there is a 15% discount for paying the entire maintenance fee for the year in advance. How much does it cost the patients to use ScheduleME? Our system is absolutely free of charge for patients. How long does it take to setup a new organization to use ScheduleME? New organizations can be setup in one week or less. The actual setup time depends on the complexity of the web site we are integrating. Once ScheduleME is setup how long does it take before staff members can begin using the system to setup offerings, add locations, etc? Changes can be made immediately. Any changes and updates made using the administrative interface are immediately available to the public. What was the response from the public that used ScheduleME system to make appointments? We’ve received great response from the public. The system has been described as easy to use, very flexible and a welcome relief from being put on hold over the phone for extended time period. Also, the 24/7 online feature is very useful for anyone who prefers to schedule their appointments during non-regular office hours. What types of appointments can be made via ScheduleME? How are ScheduleME training sessions conducted? We provide online training using Web-Ex, GoToMeeting or other similar product. We can also provide on-site training for an additional charge. What are the training fees for ScheduleME? We provide training to our clients’ staff at no-cost. Does ScheduleME, train public health department staff on how to use the system? We provide three initial comprehensive training sessions as well as unlimited number of follow-up training sessions based on our clients’ requests. Can features be added to the ScheduleME to provide increased functionality? Yes! We encourage our clients to provide feedback that we use to add new functionality to ScheduleME. How often is ScheduleME updated with new features? Updates are released for ScheduleME every month. Updates provide increased functionality to make the system easier to use both for administrative users and public visitors. Can documents, such as consent forms, be available for public users to download when they register? Yes. Typically documents are available for download at the end of the sign up process. They can be linked so that users can download them, fill them out and bring the document to their scheduled appointment. What exactly can be customized in ScheduleME? Pretty much everything can be customized. Messages can be displayed in ScheduleME in the main screen that lists all available offerings. Message can also be customized at the beginning and end of the sign-up process to provide specific instructions o the public users. Inside of each offering different required & optional fields can be used to capture information from public users. Can multiple people be scheduled at once (say a family of 4)? Yes and no. There is an administrative option to allow multiple registrations. If that option is turned on and someone was to register; they would be given the option to specify the number of people they were registering for. Is there a maximum slots/hour that the system can handle? There are no limits on the number of time slots that can be available. Can appointment scheduling be limited to a certain group of people? Yes it can be setup to allow only certain people to register, based on whatever information you have available. There are two types of options available to do so, valid users & validation information. What is the difference between valid users and validation information? Valid users are used to limit access to schedule appointments if a certain group of users is known beforehand. That was actually one of the original uses since the supply of the H1N1 vaccine was limited to start with, a client wanted to make sure certain 'core groups' had access to the vaccine first. They identified those groups and sent them all post cards with information on how to get to the site. They had to enter their first and last name and their date of birth to be able to register. It worked quite well. Validation information is similar to valid users but it does not require every user to be setup in the system first, it only requires certain information be present. This allows access to be restricted for users that have certain information such as a password. Can ScheduleME work with multiple staff people scheduling appointments? 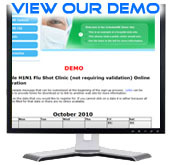 Yes, administrative users can schedule public users either by simulating the sign-up process or by entering their information into a special administrative page.